The Movement for the Emancipation of the Niger Delta (MEND) has claimed responsibility for the sabotage of facilities inside the Warri Refinery and Petrochemical Company in Warri, Delta State, on Tuesday, saying it actually wanted to carry out what it termed “Hurricane Exodus” to burn down the entire facility. 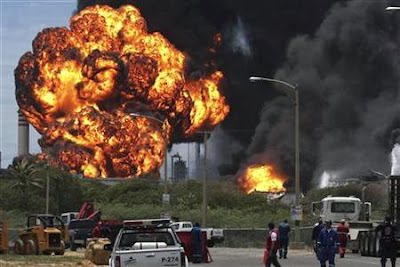 There was pandemonium at about 11.00 a.m on Tuesday, as fire engulfed the refinery. Disclosing its action in a press statement circulated electronically to journalists in Port Harcourt, Rivers State, on Tuesday, by its spokesman, Jomo Gbomo, the group claimed that its plan was to burn down the refinery. The group said the attack was a reaction to the failure of the amnesty programme of the Federal Government, adding that its onslaught against the Nigerian oil industry would not stop until government changed its approach to solving Niger Delta problem. Although information on the causes of the inferno were still sketchy, an unconfirmed source said no fewer than 10 workers died, with some others sustaining varying degrees of burns.